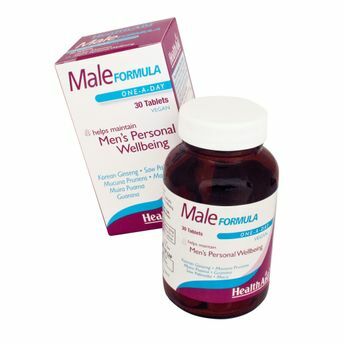 What Are Male Formula Tablets? Each Male Formula Tablet is specially formulated with key herbs like listed below for men's health & well being. Caution : Please seek professional advice before taking this supplement if you are on prescribed medication or suffering from high blood pressure. Contains caffeine. Free From Yeast, Gluten, Wheat, Salt, Dairy, Artificial Colours, Preservatives & Flavorings.